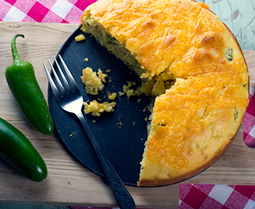 Jalapeño Relish Cornbread - A recipe from Savor California, the online showcase for extraordinary gourmet foods and beverages from California. Preheat the oven to the temperature suggested for the mix. Follow package directions to make cornbread batter. Drain the Cowboy BBQ Relish. Add either Cowboy BBQ Sweet and Spicy Jalapeño Relish or Cranberry Orange Jalapeño Relish to the batter. Stir the cheese into the batter, mixing thoroughly. Bake as directed on the package in muffin tins or a circular cake pan.